I've always thought that being early is a bit like being lucky. If you're early good things happen. 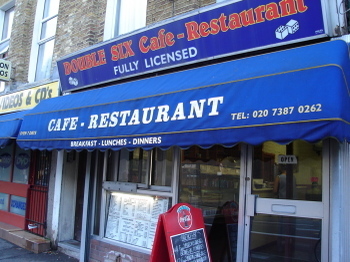 And if you're early for a train at Euston you can wander up the Eversholt Road and pop into the Double Six cafe. 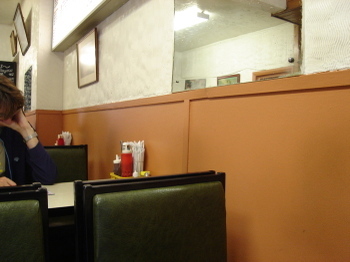 And that's a good thing to do, because this is a little gem of a traditional greasy-spoon. You always seem to find them near stations. I love those chips. They almost seem like salmon leaping over some rocks to dive into the beans. While nearby lies a limpid pool of egg. And a sylvan glade carpeted in bacon. I think this is my favourite condiment picture ever. It's almost art. The colours. The composition. The mustard. Prints of this are available at Tate Modern. I like a nice stripey cup of tea. Especially when it contrasts nicely with the table. 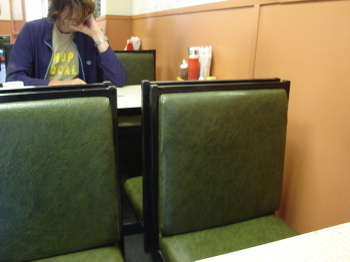 This bloke's wearing a splendid 'shop local' t-shirt. I wonder if I could get an 'eat local' one. But then I don't. I eat all over the place. But wherever I am, I eat local. And it's always nice to have a telly on in a cafe. Just in case the banter dries up. As you can see we were having a right laugh in here. Thanks for more superb pictures; makes me wish I lived closer to London. Up north, it's harder to find such a veriety of cafes. But today I made an effort to find somewhere new, with pleasant results. Thank you for the inspiration. "They almost seem like salmon leaping over some rocks to dive into the beans." 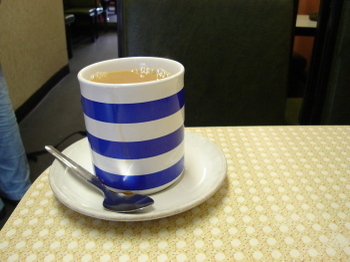 God I love the good old blue stripey crockery! I like to make these quicker pans without the formality from phone cam and p/s cameras. That is a lovely picture. Great colours. Someone call the Tate and get that picture trademarked, or at least printed, laminated and slotted into postcard racks across the country. Just beautiful! 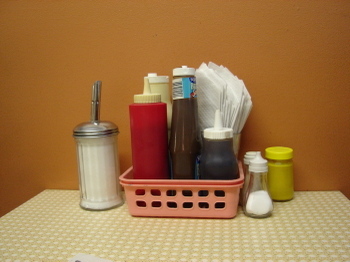 My compliments to the condiments. Only one thing could make it better in my eyes - a pot of Mint sauce. But that would be a travesty. I've walked past this place more times than I can mention. Why haven't I ever stopped?! 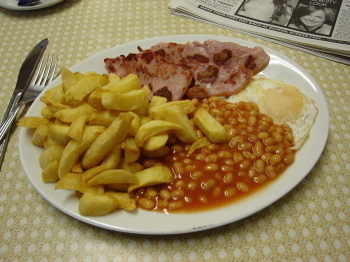 BTW - you really should try the Acropolis cafe on the market square in Derby next time you are up that way. I once sat in the Double Six with a couple of mates, listening to some cabbies at a nearby table. During an animated discussion on James Bond, one of them asked the imponderable question: "But who will be remembered in 2000 years' time, James Bond or Jesus Christ?" I seem to recall that the Full English and mug of splosh was a tasty and filling repast. Glad to know the place is still there, as I'm still mourning the loss of Steve's in Lower Marsh. I recall the occasion as described by Jim above. 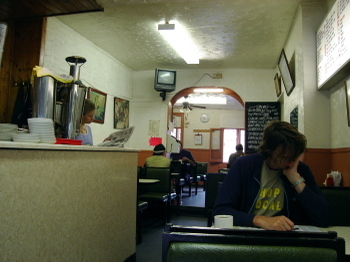 A group of us used to meet here and at a couple of other cafes.